Konami, the company behind Castlevania, Metal Gear Solid and Silent Hill, does not appear to be a fun place to work. That’s according to reports in the Japanese press and new information shared with Kotaku by people close to the company. They describe a game development environment where Big Brother is always watching and where even your snack breaks are logged. The gaming giant has recently been under fire as it transitions from the heralded company behind Castlevania and Metal Gear to a mobile-gaming-centric facility that’ll produce a Silent Hill slot machine as it pulls the plug on making a new Silent Hill and yanks a much-lauded interactive trailer for said game. The months leading up to the September release of the biggest Metal Gear Solid ever have been marred by Konami’s strange handling of its most famous game creator, Hideo Kojima. Amid all this are accusations that Konami is run less like a game studio and more like a prison, with developers cut off from the internet, kept under surveillance, and shamed if they spend too much time at lunch. Some of those allegations appeared in a recent report by the Japanese newspaper Nikkei, a report we highlighted on Kotaku earlier this month. Soon after Kotaku’s story ran, current and former Konami staff reached out, providing more information on the situation there. Here’s what they said. Konami has an official division called the “Internal Audit Office” (内部監査室). One Konami employee compared them to the company’s own secret police. This division checks internal communication, such as email, Konami’s closed circuit cameras, and monitors who leaves and enters the company. One source said that the Internal Audit Office will even contact the employers of ex-Konami staff to tell the new companies how awful these former workers were. There is also a team within Konami called the Monitoring Group (モニタリング課). The team sit in a room that’s filled with monitors showing the internal CCTV feeds from cameras located within Konami. There are cameras in the company’s rooms, corridors and data centers. The Internal Audit Office has access to all this information for employee monitoring. Konami employees who want to use the internet must apply via the IT department for an internet VPN. Employees who want to take a laptop home must also apply. If approved, they log in through a VPN. According to one former employee, screenshots of employee computers are randomly taken, which sometimes results in employees getting in trouble for what’s on their monitors. There are rules about which entrance and exit employees can use, say current and former staff. When leaving, employees must show their Konami I.D., but then tell the security guard where they are going, whether that is to a nearby convenience store or just stepping out for a smoke break. When employees leave during normal business hours, this is tracked and compiled into a list. Employees who leave too often are reprimanded. Current and former staff say that every Monday morning, Konami’s Operating Officers have a meeting which is taped and broadcast on an internal Konami website. All Konami employees must watch this meeting, and this is tracked. Employees who fail to watch the meeting have their name and division announced throughout the company. Many companies monitor their employees, and when you work in a company, sacrificing your own privacy might be part of the deal. At Japanese game companies, time cards and pass keys are standard, but Kotaku spoke to several Japanese game company employees, working at companies of various sizes, who described Konami’s approach as “extreme” and “not the norm” in Japan. Current and former staff, and even those at other Japanese game companies described Konami’s surveillance and corporate culture as draconian or North Korean. It’s unclear why Konami feels it needs this much security. Until recently, very little information seemed to leak from the game company, which has instead been suffering from a talent drain. Over the past few years, several of Konami’s biggest creators have left the company. Akari Uchida, creator of the popular Love Plus series, left Konami this past March. Koji Igarashi, famous for the Castlevania series, exited the year before. Earlier this summer, Akira Sakuma, creator of the beloved Momotaro Dentetsu games, expressed his disgust towards Konami on Twitter. Love Plus, Castlevania, and Momotaro Dentetsu were some of the most famous titles Konami put out. These are just the “name” game creators. 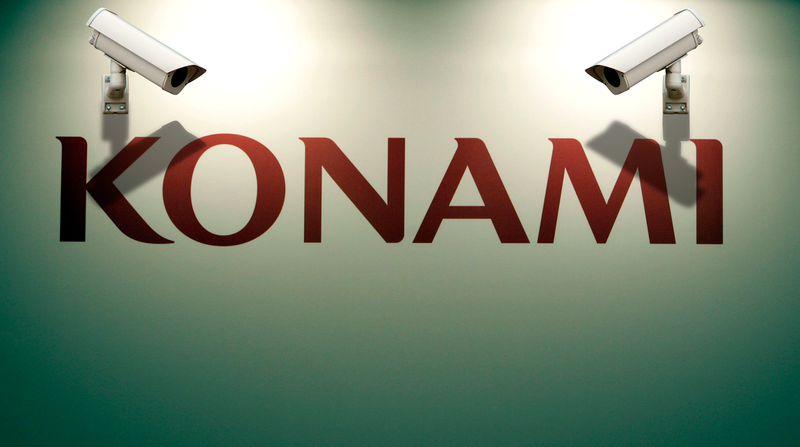 Konami has cycled through numerous other employees, current staff tells Kotaku. No doubt Konami still has capable developers, but who would want to work in a corporate culture like this?